These Custom made, handcrafted, top quality leather with soft padded center. Premium quality 1 1/2" elastic with 1" roller buckles. Hand made in the USA. Sizes: 60, 62, 64, 66, 68, 70 and Custom size. Colors: Black, Havana We try to keep these in stock, however if we are out of your size it can take at least 4 weeks to make. These are custom sizes and exchangeable only. If the size you need is not listed here, please add the custom size to comments box at checkout. If you add the girth and the Tacky-Tack Saddle Pad to your saddle, you will have a very secure saddle. You can also use the girth by itself, to help stop the need to over tighten the girth to keep your saddle from slipping. Size: 60", 62", 64", 66", 68" and 70"
This Dressage Girth is nicely padded for comfort and contoured for fit. Made of quality leather, it has stainless steel roller buckles for easy tightening and elastic at each end for even pressure distribution. Sizes: 36", 38", 40", 43"
Adds up to 7 inches to your girth. Stainless steel roller buckles. 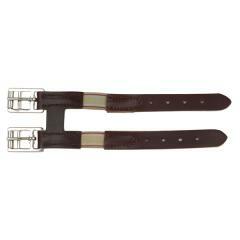 ALL horses love the comfort of this padded and curved leather girth.